Spring water cascading toward the lower pools. Cascade Springs is a refreshing oasis of lush vegetation, inviting pools, and cascading waterfalls located within the Uinta National Forest in the Wasatch Range, east of American Fork Canyon and west of Wasatch Mountain State Park. Water from the springs flows over a series of travertine terraces and pools and eventually continues on its way to nearby Provo Deer Creek. A variety of mammals and birds make their way here, including otters, beavers, deer, moose, elk, wild turkeys, hawks, hummingbirds, and numerous songbirds. A trail system of paved paths, raised boardwalks, and wooden bridges consists of three interconnecting loops, permitting visitors a choice of walking only a short distance or completing all three loops for a longer walk. Benches are provided along the walkways, allowing for rest and taking in the beauty of the surroundings. Interpretive signs present educational information about Cascade Springs’ geology, water cycle, wildlife, and plant life. The lower pools loop is the most popular section with its easily accessible pathways and soothingly cool woods. It is very relaxing to walk along the maze-like configuration of boardwalks raised over shallow, crystal clear pools and waterfalls, surrounded by a variety of trees and flowering plants. 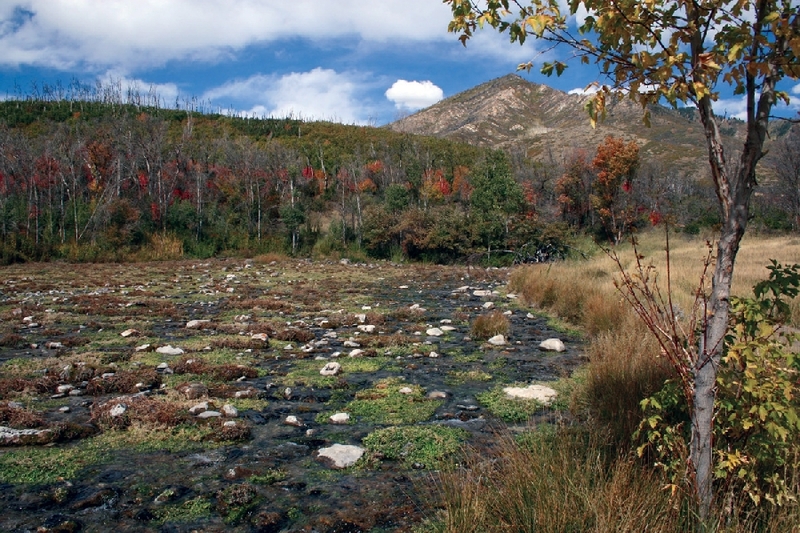 These pools contain abundant brown trout (no fishing allowed) believed to have originally migrated from the Provo River. The middle cascade loop begins at a wooden bridge situated over a waterfall with trails continuing up the slope on either side of the cascading falls. 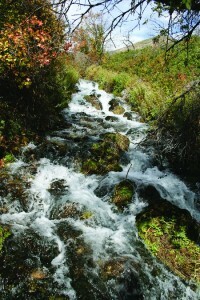 The rushing streams along these trails feed the lower pools. The spring water flows out of the ground within the center of the upper springs loop. 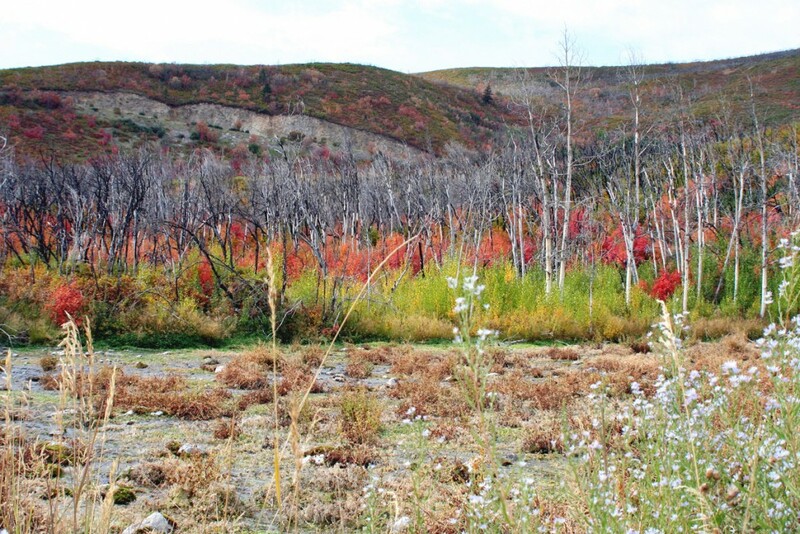 This pathway is also the best place to see new plant growth and the recovery of the landscape from a 2003 prescribed burn in the area that escaped containment lines. Thankfully the structures and most of the signs at Cascade Springs were not damaged by the fire. The area around Cascade Springs is underlain by coarse-grained glacial sediment deposited when glaciers covered high elevations of the Wasatch Range approximately 30,000 to 10,000 years ago. 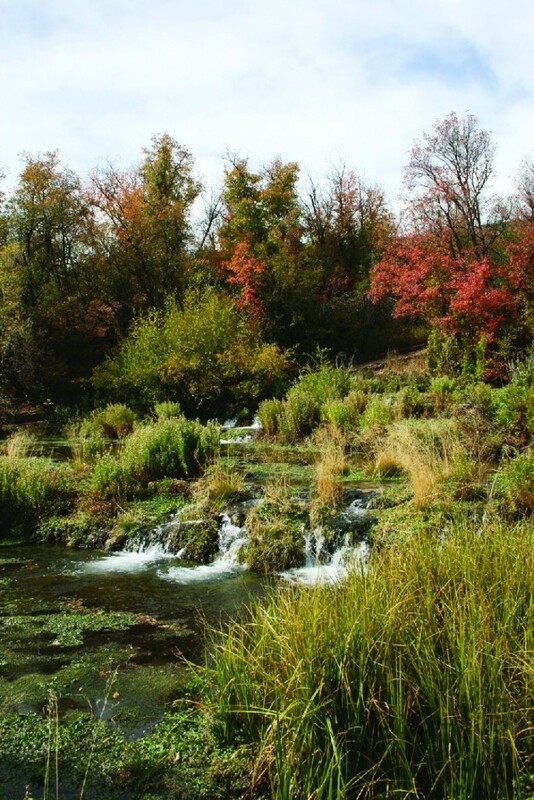 More than 7 million gallons of water flows through Cascade Springs each day. The original source of this water is rain and snow falling on the Wasatch Range. Precipitation that does not end up in streams, evaporate, or get used by plants infiltrates slowly downward along bedrock fractures to become ground water. Ground water passes through the tilted rock layers until it encounters an impermeable layer, which redirects the water upward toward the surface where it seeps through the thin layer of glacial deposits. As the water moves underground, it dissolves calcium carbonate from rocks such as limestone and dolomite. After reaching the surface, the water cascades over the terraces and releases carbon dioxide gas, which changes the water chemistry and allows calcium carbonate to be precipitated forming travertine, a finely crystalline limestone. The terraces around the pools are slowly but continually changing shape as new travertine is formed. From I-15 in Utah Valley, take the Highland/Alpine exit (Exit 284). Travel east for about 8 miles on State Route 92 to the Forest Service entrance station ($6.00 fee). Continue up American Fork Canyon on SR-92 (Alpine Loop Scenic Byway) for about 17 miles until you reach Cascade Scenic Drive. Turn to the northeast (left) and travel about 61/2 miles to the Cascade Springs lower parking lot. In the town of Midway, travel west on Main Street. Turn south (left) on Center Street/State Route 113 and drive about 1 mile to 970 South Street. Turn west (right) on 970 South for 1/2 mile to Stringtown Road. Turn south (left) and travel another 1/2 mile; turn west (right) onto Cascade Springs Drive. Continue for about 8 miles to the Cascade Springs lower parking lot. Note: Cascade Springs may be seasonally closed. No fishing is allowed. For more information, contact the Pleasant Grove Ranger District, Uinta-Wasatch-Cache National Forest at (801) 785-3563.